What does coffee have in common with a dog? What does a pencil have in common with a bottle cap? What does a thumbtack have in common with a human? They’re all made of the same stuff – atoms. But not all atoms are the same. Each atom is comprised of a very specific number of protons and neutrons and even changing one of these changes the very nature of the atom itself. Subatomic is a game about building atoms and not just the atoms themselves, but even the stuff that the atoms are made of. 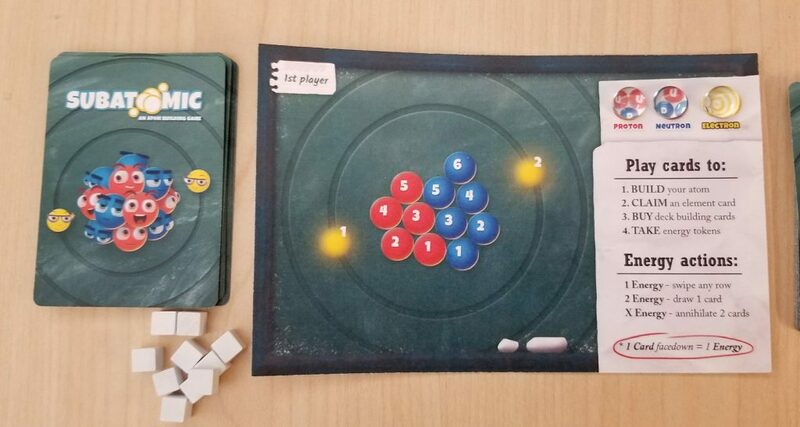 Subatomic is a deck building game wherein the players will use their starting deck of cards – a handful of Up Quarks, Down Quarks, and Particle/Wave Duality cards to claim Proton, Neutron, and Electron cards which they can add to their deck in order to eventually construct elements which are where the victory points in the game come from. On each player’s turn, they will play cards from their hand in order to build up their energy reserves, claim cards to add to their decks, or build the elements they will need to score points (or some mixture of the three) before passing their turn to the next player. Gameplay continues in this fashion until the game end conditions are met at which time the players will calculate their final scores. The person with the highest score will then win the game. At this point, if you’re wanting to know more about how the game is played, then keep on reading. Otherwise, feel free to skip to the Thoughts section to find out what I think. 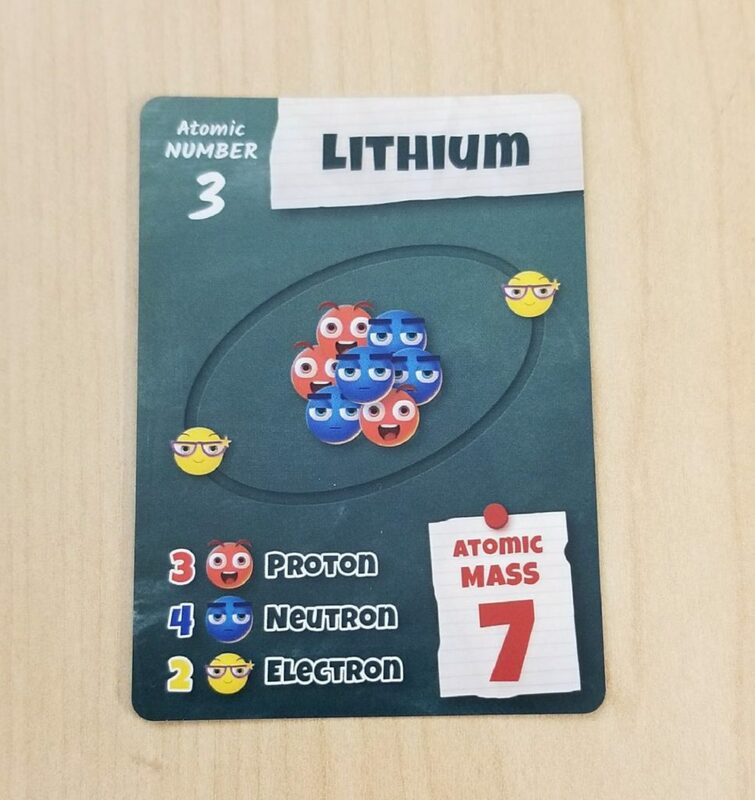 Subatomic comes with a variety of cards that are broken down into several subtypes – Starter cards (quarks and particle/wave duality cards), Single Subatomic cards, Larger Subatomic cards, Elements, and Scientists. The game also includes 4 player mats, a central game board, and a collection of tokens and markers which are used to track various different things. While I can’t speak to the quality of the final components (as my review copy is just a prototype) I can tell you that the current artwork on the various elements of the game is very well done. They’re bright and colorful and fun in nature. Tomasz Bogusz has brought his A-game yet again. While Subatomic might be a game built upon hard science, the theme presented by the artwork is very approachable and inviting. The graphic design is top notch and the information needed to play the game is presented in an easy to read format. No need to constantly resort to a player aid to try to decipher what all of the iconography means! The game board is set between the players and the Element deck, Single Subatomic card deck, and Larger Subatomic card decks are shuffled and placed face down into their starting positions. Then a number of cards from each deck are drawn and placed face up into their appropriate locations. Four Scientist card types are chosen at random and these are arranged above the game board and the annihilation cube is placed on its starting position on the annihilation track. The goal tiles are shuffled and placed randomly into the End Goals area (one per element type) and then the energy tokens are placed close by where everyone can reach them. Now you’re ready to set up the player boards. Each player receives a player board (making sure someone receives the player mat labeled with “first player”) and a deck of starter cards. They also receive Proton, Neutron, and Electron particle markers which are placed onto their areas of the player mat. The starter cards are shuffled and placed to the left of the player mat facedown to form a draw pile. Room should be left below the player mat as a “Cards in Play” area and room should also be saved to the right of the mat for a discard area. Once all of this has been set up, each player draws five cards and you are ready to begin. There are two different types of Subatomic Cards – Single Subatomic and Larger Subatomic – and they each have several things in common. At the top of each card is the card’s title which also shows what the card can be used for (i.e. – 1 Proton can be discarded in order to obtain a single proton). In the middle of the card is an illustration of the particle(s) in question. Beneath this is the base cost to buy the card from the lineup. In order to purchase a Neutron card from the lineup, for instance, the player would have to pay 2 Down Quarks and 1 Up Quark (or even another Neutron card!) from their hand plus the Energy cost of the column in which the purchased card was located. Single Subatomic cards feature a single particle while Larger Subatomic cards feature multiple particles of the same type or even different types. Lithium has an atomic number of 3 and an atomic weight of 7. It is an element comprised of 3 protons and 4 neutrons. This is reflected in the card’s cost which is 3 protons, 4 neutrons, and 2 electrons. Since the atomic weight is 7, this is how many points this card will be worth at the end of the game if a player has claimed it during the course of the game. To the left of the Element card stack is the End Goals area. This area is divided into areas for the four different elements plus an additional “Element Set” area. Whenever a player claims an Element card, they will place two of their goal markers into one or two of these areas that are different from the Element card that they just claimed. 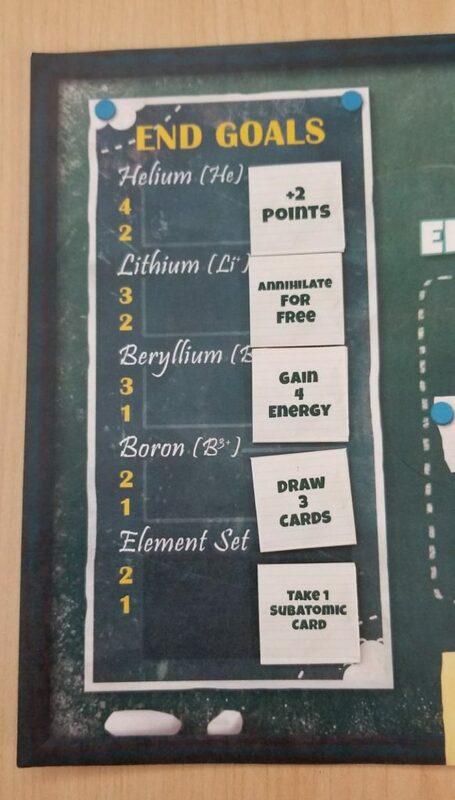 So, as an example, if a player claimed a Helium card, they could place a goal marker in the Lithium area and a goal marker into the Beryllium area OR they could place both markers into the Element Set area OR any other mixture of the various areas as long as they do not place one of their goal markers into the Helium area. If there is a Bonus tile in the area where their goal marker was placed, they can collect that goal marker and either use it immediately or hang onto it to use on one of their later turns. 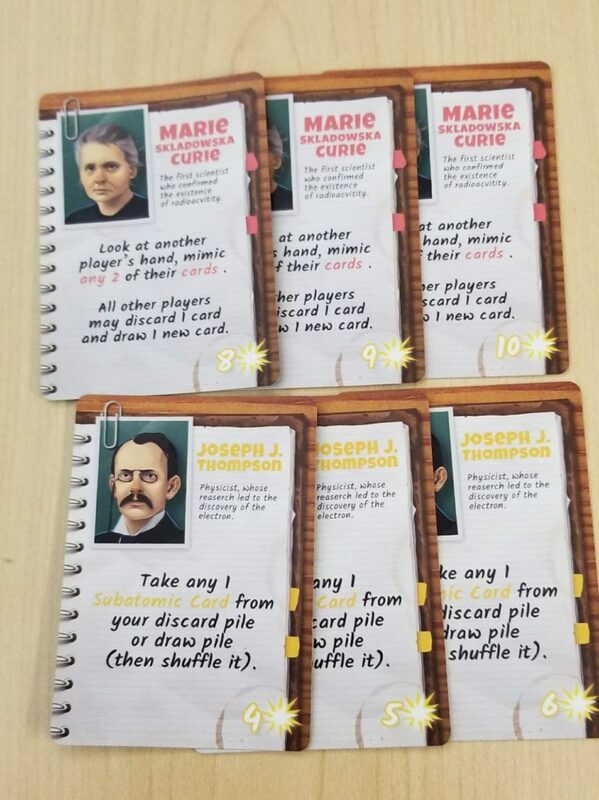 There are seven different Scientist cards included in the game. Each of these scientists provides the player with some kind of special benefit when played into their Cards in Play area from their hand. To obtain one of these cards, the player will pay the energy cost printed on the bottom of the card and then add that card to their discard area. There are only a limited number of each Scientist card and each card of the same type becomes progressively more expensive to purchase. 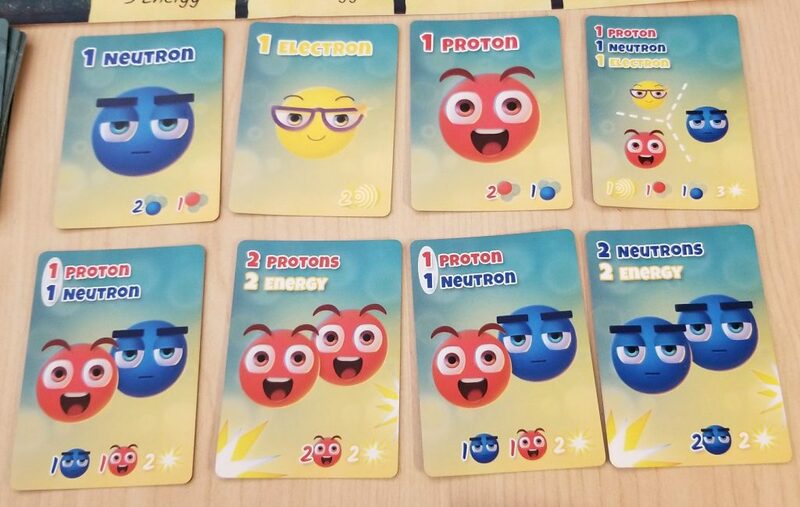 If the player has the correct amount of Neutron, Protons, and Electrons stored up on their player mat, they may claim one of the matching Element cards from the game board after paying the energy cost associated with obtaining the card. Their Proton, Neutron, and Electron markers are removed from their player mat after doing so. Build up their atoms on their player mats by paying the correct cards and adjusting their Proton, Neutron, or Electron markers accordingly. For example, discarding a 1 Proton card would allow you to increase your Proton level on your player mat by one. Once the player has performed all of their actions, if they still have cards left in hand, they may discard as many of them as they wish along with any cards in their Cards in Play area and then draw back up to 5 cards creating a new draw pile by shuffling their discard pile if need be. Next, a cleanup takes place in which any cards left in any rows are moved to the right to fill in any empty holes and then new cards are drawn and placed into the leftmost positions. Then it is the next player’s turn. The endgame is triggered once someone places their last two goal cubes. Once this happens, the round is finished ensuring that each player has had an equal number of turns. Then the players tally up their scores. Each End Goal is considered separately. The player with the most cubes in an area receives some points as well as whoever is in second place. The players also receive points from each of the Element cards that they have collected during the course of the game. Whoever’s got the most points is the winner. I’m a big fan of deck building games. They give me the same satisfaction that tableau building or tile laying games provide. Everything starts off on a small scale, but steadily grows over time and that’s fun to watch. In Subatomic, this is literally what happens. You’re starting off with a handful of elementary particles and there’s really not much you can do with them aside from turning them into energy or using them to create (purchase) Subatomic particles. As these cycle back into your hand, things really start getting interesting as not only your deck begins to grow, but your atom begins to take shape on your player mat. Watching these things grow (and your number of viable actions along with them) is very satisfying and makes for a rather enjoyable experience. Now, if you’re like me, you’re probably not a huge fan of randomness in games. Losing a game due to some circumstance that is completely out of your control isn’t any fun. Deck building games, by their very nature, are almost entirely built upon the back of a random card drawing mechanic. The key to mitigating this kind of thing is for the game to provide some sort of mitigation. And that’s where the Annihilation track comes in very handy. Not only does annihilating cards eliminate two cards at a time, but it also requires me to make a choice between spending valuable, hard-earned energy to give up a card advantage now for better card draws later or spending those cards and that energy to do something else. I like having plenty of options and I like being able to thin my deck. Including the annihilation track was an excellent call. Another thing of note is that you are allowed to hang onto cards between turns. In situations where you’d really like to annihilate a few cards, for instance, but you find yourself holding onto a handful of Subatomic cards and maybe one elementary particle, being able to hang onto that elementary particle in the hopes of picking up a second one in the next round is a very handy thing indeed! Most deck builders force you to toss your entire hand before drawing back up and I think that Subatomic would suffer for it if this were the case. This, coupled with the ability to turn unwanted cards into energy, means that unlike a lot of other deck builders, you never have a wasted hand. In my review of his previous game, Cytosis, I gushed about John Coveyou’s impressive ability to take complicated scientific processes and compress them down into interesting games. That hasn’t changed. If anything, he’s only gotten even better at his craft. If John Coveyou’s intention was to create a game that would get me thinking about all things atomic, then he can pat himself on the back for a job well done. Within minutes of starting the game, I found myself wondering things like “If atoms are made of Up Quarks and Down Quarks, then what are Quarks made of?” That question just kept eating at me the entire time that I played that first game and I almost immediately jumped on the internet and started searching for answers as soon as the game came to an end. I’d tell you what I discovered, but that would be giving it away. Science, like board gaming, is about the experience of discovery. Like hunting around on the internet to find the answers to complicated questions, playing Subatomic is well worth the time investment. As for the negatives, I’ve racked my brain for even one single negative thing to say about this game and I’ve got nothing. It’s just that good. Subatomic is challenging, informative, and never overstays its welcome. It’s just as complex as it needs to be without overcomplicating things. Everything about it is just right. Genius Games has hit this one out of the park. Next postTeam Play Review – A New Alternative to Classic Card Games!